Photographer Mikel Lasa has always been attracted by the corner of Mercaderes with Estafeta Street, very close to one of the Kukuxumusu stores, but he never seemed to be able to arrive there on time. By 5.30 a.m. all the places there seemed to have been taken. So, most of the time, he had to do with getting a place on the opposite corner. With the passing of the years, he became more organized and he began arriving at his pet ‘spot’ at 4:30 a.m. or even earlier, equipped with his anti-sciatic foldable chair. My first experience of taking photos from that spot was quite awesome. The loud whack of the bulls as they hit the wooden hoarding was immense. And the tension generated by their entrance into Estafeta was really high”, affirms Mikel Lasa. 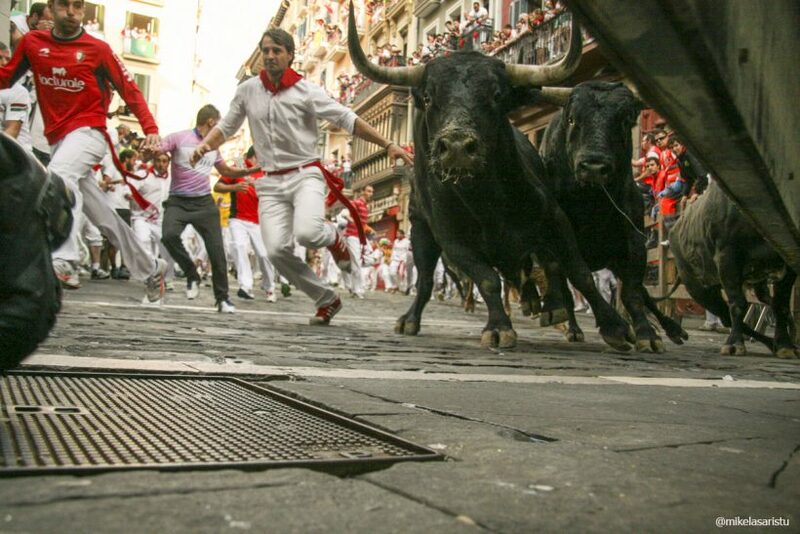 Years later, the anti-slipping product which began to be smeared on the pavement meant that now the bulls were sometimes taking this corner like professional runners. Mikel Lasa himself can best explain how this changed his experience of the Running of the Bulls event. “One day, I decided to start taking the photos from ground level. For a while I was ready to give it all up but as there was a new system introduced for the photographers of choosing places depending on who showed up first, it was necessary to decide between ground and fencing. So I decided to choose the ground level. This photo was one that I took on that first day. Every time I see it or I remember it, I relive that moment and it seems like I took it just a few seconds ago. I got real scared later when I remembered it. With the heads of the Miuras just a few inches from you, the clatter of the hooves hitting the cobblestone and echoing through the first line of fencing. Certainly, that is without a doubt one of the most privileged spots from which to capture the essence of the Running of the Bull on film, as has been shown by Pío Guerendiáin, who, for nearly half a century, was clicking away from his cat flap behind the hoarding of his store which has recently disappeared. This photo from Mikel Lasa was taken on the 14th of July, 2013.